Inspired by the works of architect Antoine Gaudi, artist/designer Manuel Baez led the creation of this amazing, interactive public art installation that combined light and movement into an amazing, glowing canopy over the ByWard Market in the fall of 2016. 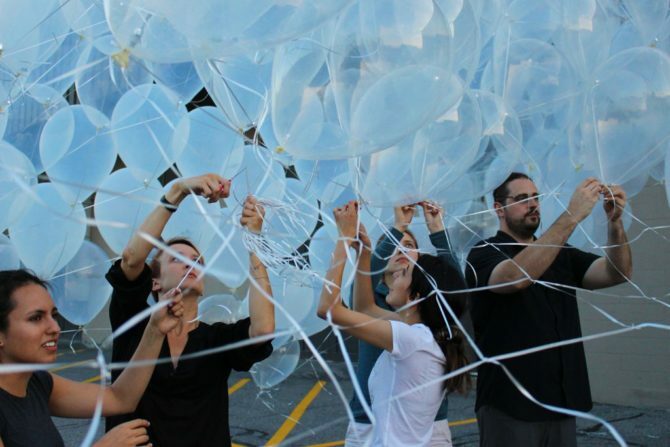 Hundreds of volunteers from the Azrieli School of Architecture & Urbanism – Carleton University, the Canada Science and Technology Museum, and the Children’s Hospital of Eastern Ontario, helped make the glowing, floating canopy that illuminated the skies over Ottawa a tremendous success. The goal of the project was to deploy large-scale outdoor architecture that is designed and engineered to allow people to modify and shape it in real time. In other words, can we create a kinetic and dynamic architecture that adapts to human interaction? The hundreds of community members who stopped by the installation demonstrated this ability by pulling on the guy wires that supported the canopy, morphing it into various amazing shapes. Most importantly, the looks of pure wonder on the faces gazing up at the floating, luminescent ceiling above them was enough to validate our theory–that when science, discovery, and play come together, great things happen.